Discover the rich history and traditions of Norway's iconic black-and-white mittens. What started as a dare became an icon of Norwegian knitting and started a snowball of knitting traditions across the North Atlantic. Selbuvotter: Biography of a Knitting Tradition follows the story of these beautiful mittens and gloves, from folk tradition to major regional industry to national symbol, and passes the tradition on with over 30 patterns taken from actual antiques. Every aspect of business today can be found in the story of Selbu knitting. And above it all, thousands of women and men, using spare moments to create spectacular designs that are as fresh today as they were 150 years ago. 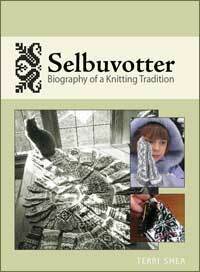 Selbuvotter is being distributed by Unicorn Books and Crafts Lacis, and Arnhild's Knitting Studio. Please ask for it at your local book or yarn store. February 13, 2013 Postal rates have increased again, but it's still much cheaper than UPS or FedEx. I have recently updated the listing on Amazon.com, if you prefer to use a familiar vendor, or add up to get free shipping. Don't forget to look at terrisheaknits.com for more of my designs. February 1, 2009 I'm hearing rumors that Selbuvotter is out of print. They are false! I have lots of copies available. You can order an autographed copy directly from this site, or order from your favorite book vendor. I cannot control what people resell it for on Abe Books or Amazon, but don't let those false high prices fool you. The book is still in print, and will be as long as I can keep ordering more print runs. March 6, 2008 The second printing books are in and shipping! If I did my job right, all of the errata have been fixed in the second printing, but if you find something that you think is in error, please let me know. You can start with the Selbuvotter groups on Ravelry or Yahoo.